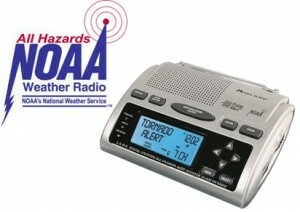 Weather radios provide life saving information when severe weather strikes. 'The voice of the National Weather Service' can even sing Christmas carols. NOAA Weather Radio (NWR) is called ‘the voice of the National Weather Service’ and provides critical and life saving information when severe weather strikes. ‘Tom’ is one of the latest voices that you hear when listening to it and in the holiday spirit, NOAA had ‘Tom’ sing a classic Christmas carol. NWR began in the late 1990s and now transmitters for the service allow coverage across most of the nation. When the weather is calm, listeners hear current conditions, forecasts and other weather related news. It is however when severe weather strikes that NWR reaches its real potential. Many of today’s radios can be programmed to turn on automatically and sound an alert when severe weather or another national emergency occurs. These alerts can make the difference between life and death, particularly when a fast developing situation like tornadoes occur. What does NOAA Weather Radio sound like? Listen to our live stream. We have long extolled the virtues of the system and recommended that all homes should have them, particularly in places like Colorado that are prone to tornadoes. It can also provide critical information during other types of disasters like earthquakes, chemical spills, and AMBER alerts. ‘Tom’ is one of the current text to speech voices of NOAA Weather Radio. He, along with ‘Donna’ and ‘Javier’ are the voices you hear when listening to the system. This entry was posted on Saturday, December 17th, 2011 at 4:35am MDT and is filed under Thornton Weather. You can follow any responses to this entry through the RSS 2.0 feed. You can skip to the end and leave a response. Pinging is currently not allowed.